Apple Tree unlocks after level 5.
click on a building only once per day. New in My Vineyard - NAPA VALLEY WINE TRAINS! Buy and link together train tracks (or collect them from friends) and then put TRAINS on them! Your trains will move when clicked, and you can design your very own railroad!! No Wine Cash required. Try it out! 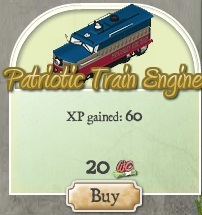 The Patriotic Train Engine sells for 20 Wine Cash and gains the user 60 XP when first purchased. 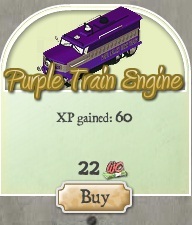 The Purple Train Engine sells for 22 Wine Cash and gains the user 60 XP when first purchased. For those who are passionate about purple. The next two trains can be purchased with Coins. 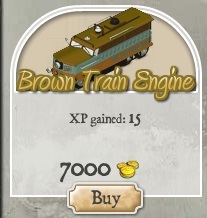 The Brown Train Engine sells for 7000 coins…quite the deal!! And gives the user 30 XP when first purchased. The perfect train for the working man and/or woman…blends in nicely with the terrain; it is the little engine that could. 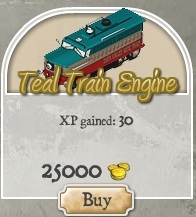 The Teal Train Engine sells for 25000 coins and gives the user 30 XP when first purchased. train to stand out from the terrain…this beauty is for you. These are the tracks you can purchase in the Market. 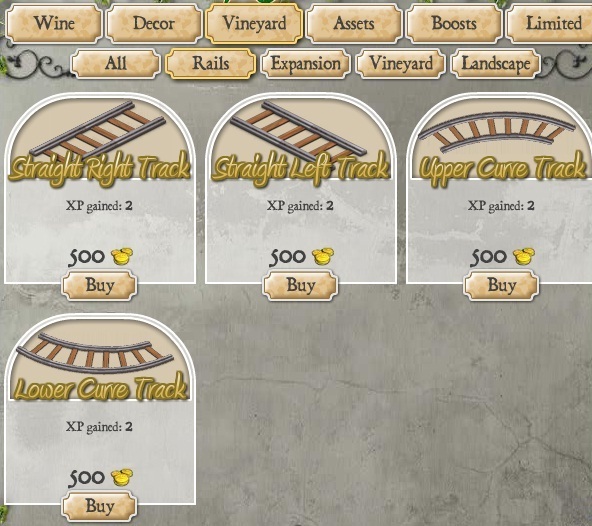 These tracks are items you receive as a gift from other players. to clear out their land as much as possible to create a flat terrain. TIP: If you do not want your train to run you can slightly overlap your tracks to keep the train in place. *Requires eight neighbors before it can be applied. Please note that the following charts below are a work in progress. Please use them as a general guide. Thank-you to Amerilis Ersery for helping to fill in the Level names! Thank-you to Elizabeth Rozier for helping to fill in the number of barrels!